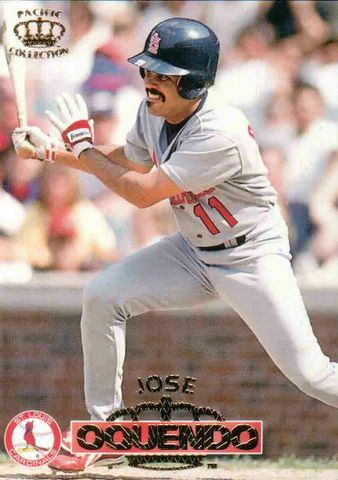 Kat and Karl : a tribute to "the secret weapon"
a tribute to "the secret weapon"
this post is dedicated to the St. Louis Cardinals current third base coach and former player - jose oquendo! he played in STL 1983-1995 and he was ALWAYS my favorite! OF -63 - this included games in center, left, and right! first national league player to play all 9 positions in a season! When i was little i wanted to be just like JOSE (yes a boy and yes a baseball player... later i wanted to be the first woman in baseball! haha! jose is the cause for my obsession with the number 11 for all MY jerseys had to be #11! ) My dad and i would keep score in the little scorecards at busch and there were frequently 6-4-3's! to report when jose was around! You craaaaazy people that keep up with sports so well. My favorite sport is Survivor. Ha. What are sports?...J/k, I used to be a pretty big Minnesota Twins fan in my younger years. Too bad they stink now. Wow, I'm impressed at your extensive knowledge of this dude, Kat. P.S. I LOVE sports. When I was little, I wanted to be Coby Jones (though I didn't want his jersey #13)! He played forward for the Men's USA Soccer team. I actually met him in the London airport once too when I was 13! Got a picture and his autograph. I haven't always been like this, mind you. I had an ENORMOUS obsession with Corliss Williamson and the Razorbacks cerca 1995. I have a couple autographs from him. I loved him. Since then, the sparkle has faded. I think it's because I don't live with my dad anymore and because all my girl friends in college scoffed at my love of college basketball. Ehh... What can you do?? ok.. i never wanted to be anyone in sports... i just wanted to be "WITH" Chiper Jones!!! my family are die hard "cards" fans so it always made them mad.. b/c he played for the braves... i don't know what he does anymore!! !